Lucretia Knapp is a video, new media artist and photographer. 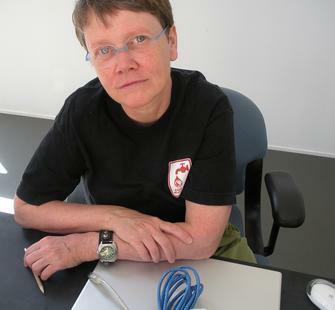 Her work involves subtle and complex workings of digital still, time-based images, and sound. She uses the genre of portraiture to narrate complex relations between family and home, loneliness and self-determination. The short videos Lonesometown and Ghost of a Flea problematize time, movement and perception, in relation to a central character. A recent work, Swim Suit, is an experimental documentary short (distributed in the US and Canada by Frameline of San Francisco) that is part of a larger work on transgender identities. Swim Suit embodies and complicates her ongoing engagement with gender, in a lyrical and fluid experimental form. She has exhibited nationally and internationally, most recently in film and video festivals in Chile, Hong Kong, Paris, Torino, Melbourne, New York, San Francisco, Los Angeles, and her home state of Ohio. Her writing has been published in Out In Culture: Gay, Lesbian and Queer Essays On Popular Culture, Cinema Journal and most recently, the new edition of A Hitchcock Reader. She teaches video production and digital imaging in the Film Studies Department at Smith College and at the International Center of Photography in New York. At Montalvo she will work on short videos created through the recording of digital puppetry. The digital source materials will be derived from virtual performances made via a character of herself within the 3D virtual world of Second Life, culminating in a kind of condensed Machinima. She will also be tinkering with sound and visual compositing programs.